PRE-ORDER. DELIVERY IN JULY 2019. Start as a plant or animal making first landfall half a billion years ago, then evolve it on drifting continents in the face of competition and huge ecological events: Win if become the dominant herbivore or carnivore. In the full game you can grow from 200 grams to 20 tonnes. The atmosphere is tracked for oxygen, cloud cover, and greenhouse gases, and the decisions the players make influence the climate. Vassal module by Samuel Williams. 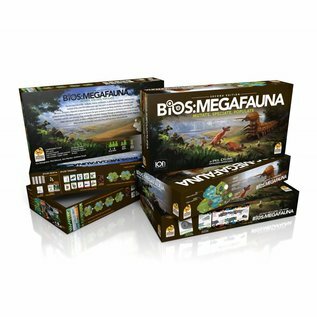 Bios Megafauna comes with 8 "continents" that can drift around, 160 mutation cards, 140 wooden laser-cut creeples of flying, burrowing, swimming, and armored creatures, various tokens of fossils and monsters, 110 wooden cubes, 42 climate disks, and 20 dice (mainly to track creature size). For the full game, there are 3 latitude strips and a climate board that tracks oxygen, clouds, and greenhouse gases. The game is the second game of the "Bios" trilogy, which can be played together or separately. 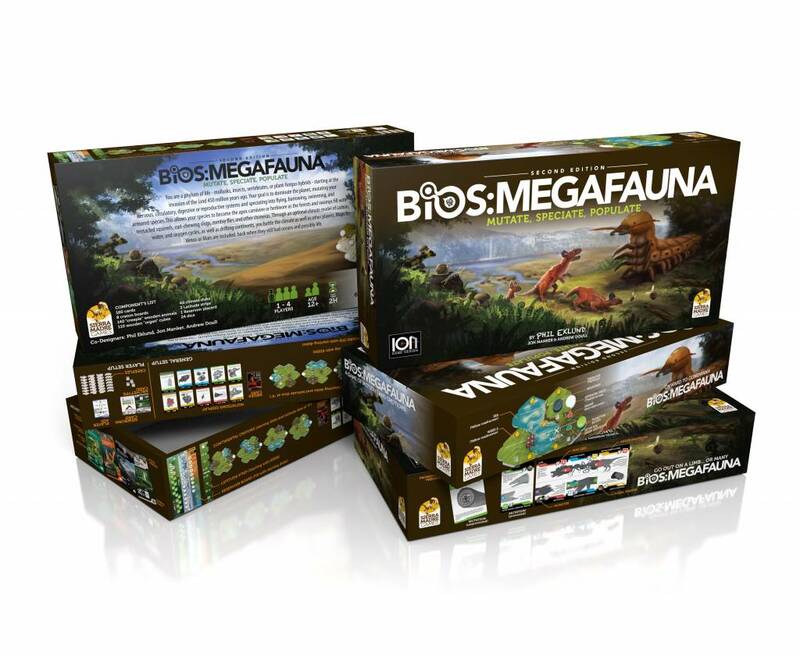 See Daniel Thurot's review on BGG about Bios Megafauna. "Wow. Just wow. Depending on how you count, a game which hits 14 out of 14 points... I'm really excited about playing this one again. I'm not sure if the novelty of the 108 mutation cards and 144 tiles will wear off, or if I'll tire of imagining sail-backed bipedal giraffes with disembowling claws or massive underground communities of tool-using insectivore lizards with wings. There may not be any such thing as a "perfect game", but Phil Eklund has managed to make something which, for my money, is a close as anyone has gotten." Christopher O. Read Jon F. Zeigler assessment of Bios:Megafauna.